Two years ago today I saw the first evidences that there was life inside my womb. Pulling into the LifeCare Pregnancy Center, my heart was pounding. I didn't know what to expect, I simply knew I was going to be a witness to the miracle of life. The very hand of God was at work within my womb, shaping and creating this wonderfully and fearfully made individual. He already knew her long before I did. He knew her spirit long before I even knew I would have a beautiful daughter named Lily one day. I was barely 15 weeks pregnant. For three and a half months, she had been alive. I had wanted to have an ultrasound a month before this, but it didn't work at out the Pregnancy Center in Charlottesville. 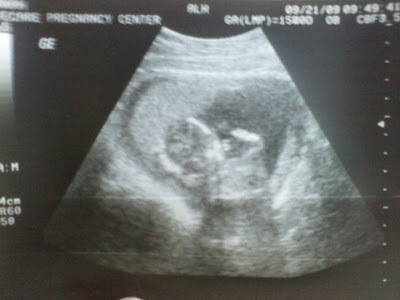 I had wanted to have one the week before at LifeCare, but with only one ultrasound machine, we moms had to wait. So, there I was...September 21st, 2009. I had waited for this day my entire life. The day that I would see with my own two eyes that I was a mother. We went back to the little room and I got up on the table. It was 9:30 in the morning. Right across from me, hanging on the wall was a picture of a Lily. My heart already knew she was a her. Doctors didn't have to tell me that. My heart was bonding with her heart, with my little girl's heart. Months later when I went back into that same room where I saw her for the first time, the picture was gone. Strange. I wanted to take a picture of it to put in my scrapbook.